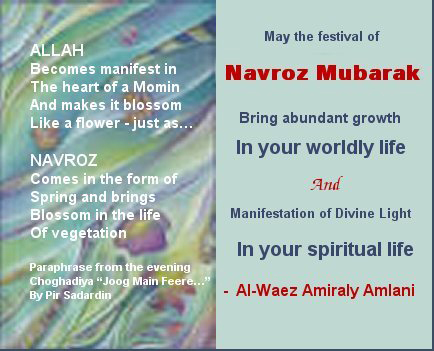 Explanation of artwork: The Navroz Card has a subtle reflection of 'Flower' and 'Light' - which symbolizes RUH and NUR, and it blends with the message by Pir Sadardin that the spiritual Navroz brings enlightenment in the Momin's heart and makes it like a blossoming flower, just as the physical Navroz brings new life and blossom to the vegetable kingdom - and therefore the Pir invites us to seek that spiritual Navroz for our souls. 1. Is the real 'Heart" in the head? 2.What are the five senses of the real 'Heart" (i.e., the subtle spiritual faculty)? Please note that the intellegence of the subtle spiritual faculty (i.e., the higher intellect) is different than the faculty of rational thinking and learning. The higher intellect is gifted and not learned! 3. How does the real 'Heart' (i.e., the subtle spiritual faculty) get involved in Dhikr? Please note that when the heart takes over the dhikr, the dhikr becomes automatic. This stage is defined as 'ajampiya jamp' in the ginanic literature where the invocation of the bol (Ism-i Azam) becomes automatic. Real spirituality begins when a person reaches this stage in his/her bandagi (meditation). This topic has been addressed in many of my previous posts. 4. How does dhikr get established in the innermost secret part of the real 'Heart' (i.e., the subtle spiritual faculty)? 1Muhammed Isa Waley. Contemplative Disciplines in Early Persian Sufism. In: The Heritage of Sufisim. Volume 1. Classical Persian Sufism from its Origins to Rumi. Edited by Leonard Lewisohn. 1999. Oneworld Publications, Oxford. Excerpts taken from pages 528-529.